You can come to the School by public transport or private car. 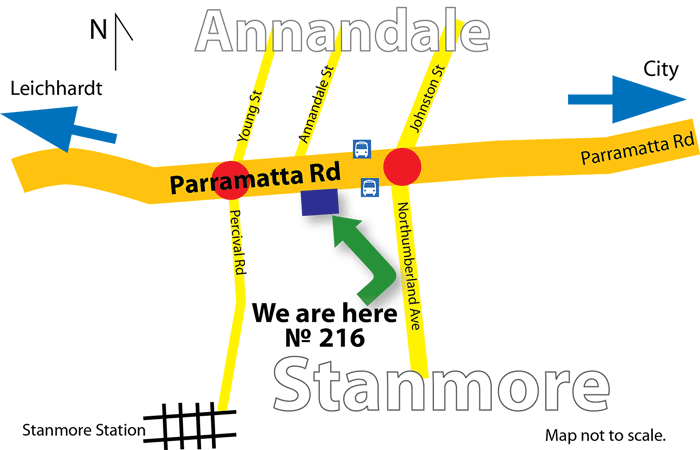 the school is located at 216 Parramatta Road, Stanmore. This section of Parramatta Road is part of Great Western Hwy or A22. There are free street parkings on Parramatta Road after 7 pm week nights, after 12pm Saturday and all day Sunday. A small parking is available at the rear of the school premises. Streets at the back of the school have no restriction and free parking. For some unknown reason, some GPS navigation devices do not have “216 Parramatta Rd” recognised in “Stanmore” suburb. We recommend entering the intersection of Annandale St and Parramatta Rd (select Annandale suburb) and we are just opposite of the said corner. If you are coming from City, you may enter the intersection of Johnston St and Parramatta Rd (select Annandale suburb), then continue drive half way down the block. The opposite side of Parramatta Rd is Annandale, and have different (non-matching street numbers). In fact the street number starts a number of times along different suburbs of Parramatta Road. Even and odd numbers also switch sides. all Sydney buses passing Parramatta Road (Stanmore) stop at the school doorsteps. Those include “limited stop” buses. Those buses are available 7 days a week and operate until late nights. Following bus routes can be taken: 413, 436, 438, 439, 440, 461, 480, 483, L38, L39, and Metrobus 10. Ask for “Johnston Street” bus stop. We are about 30 metres from the bus stop. You can catch train to Stanmore Station (T2, Inner West & South Lane, towards Homebush service, this service is not very frequent), then walk down Percival Road (about 10 minutes) and turn right at Parramatta Road. By ferry: to Circular Quay. Then either catch train to Stanmore Station or bus to the School (see above) (20 to 40 minutes ride depending on traffic condition).